Carrie Frye Interior Design designed the offices of trucking technology company Blue Bloodhound, located in Hickory, North Carolina. 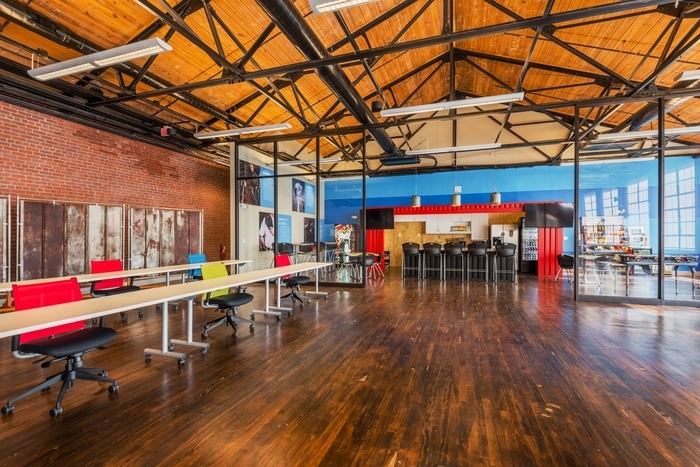 This headquarters office for trucking technology company Blue Bloodhound was built in a historic textile mill building in North Carolina. The 10,000-square-foot space was more than 50 feet wide, with no columns and expansive roof joists. The space soars with natural light and creates a collaborative environment for the call center and training facility employees who work there. And what’s a trucking company without trucks? We placed the front end of an 18 wheeler truck, with working headlights, at the reception area to bring fun energy and brand focus to the entry. A large shipping container frames the break room, which is open to the office. The eye can see from end to end of this space. Low-height workstations allow for impromptu training and high fives, keeping everyone focused on the company’s mission of changing how transportation works.